Welcome to the lifestyle at The Villages! 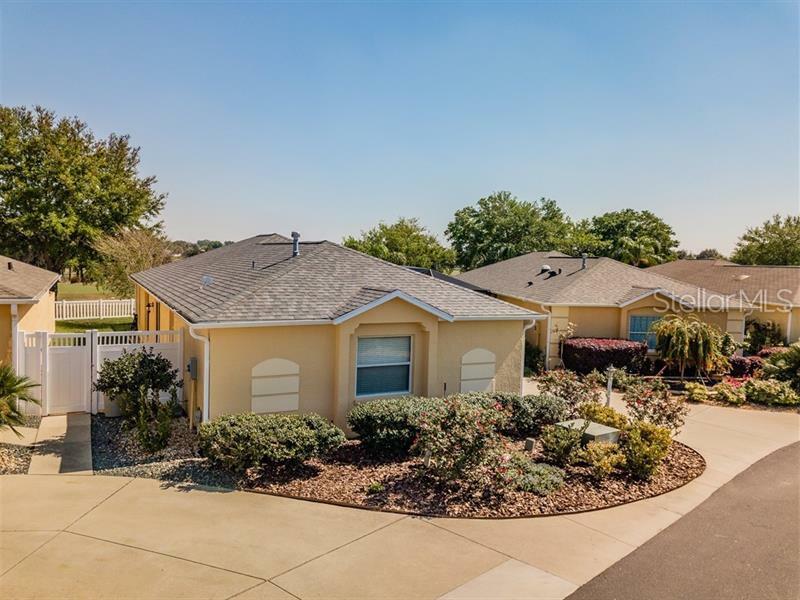 Perfectly located, this lovely landscaped 2 bedroom and 2 bath SOMERSET Courtyard Villa is enhanced with a LARGER than most LIVING ROOM, which features canned lighting and surround sound with a picturesque view of the GOLF COURSE and conservation! This MUST SEE home offers tile throughout (on the diagonal and newly grouted) with BRAND NEW carpet in both MASTER and GUEST BEDROOMS! MASTER BEDROOM has elegant French Doors, which lead to the lanai and birdcage overlooking the golf course! MASTER BEDROOM also includes En Suite Bath and walk-in closet. This FRESHLY PAINTED dwelling includes a BRAND NEW ROOF with NEWER WASHER and DRYER! The open concept KITCHEN has canned lighting, GRANITE COUNTERS, stainless steel refrigerator and dishwasher (seller giving credit towards new range and microwave at closing!) The one car garage also includes parking for your golf cart, pull down stairs for attic access and a screen door, great for ventilation. The A/C was replaced in 2013. The side yard and birdcage contains upgraded Chattahoochee. Located in Villa Berea, this home is close to shopping, restaurants, banks, recreation center, Polo Fields and so much more! *** NO BOND***!!! !